Objective: Migraine is associated with cardiovascular disorders but the underlying mechanisms are unknown. Arterial structure and function are important determinants of cardiovascular morbidity and mortality. The aim of the present study was to assess arterial properties in patients with migraine of recent onset. Methods: In a cross-sectional study, structural and functional arterial properties were assessed using ultrasound and applanation tonometry in 50 patients with a history of migraine >1 and <6 years during a headache-free interval and 50 age- and gender-matched subjects without a history of migraine. Results: Brachial artery diameter (4.82 ± 0.93 mm vs 5.39 ± 0.89 mm, p = 0.01) and compliance (0.30 ± 0.17 mm2/kPa vs 0.37 ± 0.19 mm2/kPa, p = 0.02) were decreased in migraine patients compared with controls. Femoral artery compliance was decreased in migraine patients (1.19 ± 0.55 mm2/kPa vs 1.42 ± 0.59 mm2/kPa, p = 0.04). Carotid arterial wall properties were similar between groups. Aortic augmentation index was increased in migraine patients (4 ± 10% vs −1 ± 10%, adjusted p = 0.04). Flow-mediated vasodilation of the brachial artery (normalized to peak shear rate) was decreased in patients with migraine (29 ± 15 vs 37 ± 15 10−3%. sec, p = 0.006). Conclusion: Functional arterial properties are altered in patients with migraine of recent onset. The mechanisms underlying these associations are unknown, but may include alterations in structural and functional arterial properties. Arterial structure and function are important determinants of cardiovascular morbidity and mortatility.13,14 We recently demonstrated alterations in arterial wall properties in migraine patients.15 In this study, patients were middle-aged adults recruited from a neurology outpatient clinic. Because those patients had a longstanding history of migraine and almost 50% of them used vasoconstrictive antimigraine drugs, i.e., triptans or ergot alkaloids, the observed vascular changes might have been caused by vascular injury from repeated migraine attacks or repeated exposure to vasoconstrictor drugs. To limit the potential effects of longstanding disease or repeated exposure to vasoconstrictor drugs on arterial properties, the present study assessed arterial structural and functional properties in patients with a recent onset of migraine. Fifty migraine patients with or without aura, as defined by the International Headache Society diagnostic criteria,16 and 50 control subjects were recruited through advertisements from hospital and university staff, university students, and the general population. Migraine patients fulfilling criteria for both migraine with and without aura were considered as migraine patients with aura. Major exclusion criteria were age <18 and ≥35 years; body mass index (BMI) <18 and ≥30 kg/m2; history of cardiovascular disease, hypertension (systolic blood pressure >140 mm Hg or diastolic blood pressure >90 mm Hg), diabetes, or hypercholesterolemia (total cholesterol >6.5 mmol/L); pregnancy or lactation; and regular use of vasoactive drugs (except hormonal contraceptives). Based on medical history, physical examination, and routine laboratory tests, all subjects were in good health. The diagnosis of migraine was confirmed using a validated questionnaire.17 Patients with a history of migraine of <1 and >6 years or >15 days of headache per month at any time since the onset of migraine attacks were excluded. Control subjects without a history of migraine were matched for gender, age, smoking status, and hormonal contraceptive use. Control subjects with >1 headache episode per month, a history of moderate or severe headaches, or having first-degree relatives with a history of migraine were excluded. The study was approved by the Ethics Committee of the University Hospital Leuven and conducted in accordance with the Declaration of Helsinki. All subjects provided written informed consent. After a screening visit, eligible subjects were invited to return to the hospital for vascular measurements. All measurements were performed in a quiet, temperature controlled (24 ± 1 °C) room by a single observer (F.V.) who was aware of the diagnosis. Subjects abstained from any drug (except oral contraceptives) for at least 3 days and from smoking and alcohol- and caffeine-containing beverages for at least 6 hours. Subjects fasted for at least 4 hours and remained fasted during the visit. During visits, subjects rested supine on a comfortable bed. Measurements started after 15 minutes of rest. Migraine patients were headache free for at least 72 hours. If a migraine attack ensued within 24 hours after the visit, the measurements were repeated in another headache-free period. Brachial blood pressure and heart rate. Supine brachial systolic (SBP) and diastolic (DBP) blood pressure and heart rate were recorded at the left upper arm using a validated semi-automated oscillometric device (OMRON 705IT, OMRON Healthcare, Hoofddorp, The Netherlands). Blood pressure and heart rate were recorded in duplicate after measurements at each artery (five times). The mean of these 10 recordings was used for data analysis and calibration of pressure waveforms. Brachial pulse pressure (PP) was calculated as SBP − DBP. Structural and mechanical arterial wall properties. Arterial wall properties of the right brachial artery (BA), common carotid artery (CCA), common femoral artery (CFA), and superficial temporal artery (STA) were assessed using an echo-tracking system (Wall Track System, Pie Medical, Maastricht, The Netherlands).18 The system consists of an ultrasound device (Esaote AU5, Esaote Biomedical, Genoa, Italy) equipped with a 7.5 to 10 MHz linear-array transducer connected to a data acquisition and processing unit. Measurements were performed at fixed anatomic locations: at the antecubital crease (BA), 1 to 2 cm proximal to the bifurcation (CCA and CFA), and at the orbitomeatal line (STA). The mean of three recordings, each lasting 5 to 6 seconds, was used for data analysis. Wall motion was tracked at the interface between media and adventitia at both (near and far) walls. End-diastolic diameter and change in diameter during the cardiac cycle (distension) were measured by recording vessel wall movements. At the STA, only end-diastolic diameter was measured. End-diastolic intima-media thickness (IMT) of the CCA and BA was measured automated, off-line as the distance between the leading edges of the lumen-intima interface and the media-adventitia interface of the far wall.19 Arterial cross-sectional compliance (CC), a measure of buffering capacity, and distensibility coefficient (DC), a measure of elasticity, were calculated as previously described.20 To compare mechanical arterial properties at the same distending pressure, isobaric distension, CC, and DC were calculated over a fixed pressure interval of 85 to 95 mm Hg. Applanation tonometry and local pulse pressure. Arterial pressure wave forms (PWFs) were recorded noninvasively at the CCA, BA, and CFA using a high-fidelity tonometer (SPT-301, Millar Instruments).21 At the CCA, vessel wall movements and PWFs were recorded ipsilaterally and consecutively. At the BA and CFA, vessel wall movements and PWFs were recorded contralaterally and simultaneously, using an ultrasound probe holder. Local pulse pressure (PP) at the CCA, BA, and CFA was calculated by calibration of the PWFs recorded at the respective sites, as previously described.22 The mean of three recordings, each lasting 5 to 6 seconds, was used for data analysis. PWV is defined as the speed at which the pressure wave travels along an arterial segment. The difference between the transit times of the distension wave from the heart to the CFA and to the CCA was used as an estimate of the carotido-femoral transit time (TT).25 The mean of three recordings, each lasting 5 to 6 seconds, was used for data analysis. TT was estimated by the delay time from the R-top of the ECG to the 10% level of the upslope of the distension waveform, which was recorded using the echo-tracking system described above. Distances from the sternal notch to the site of measurement at the CCA and CFA were measured using a tape measure and the difference between these two distances was used as the length of the carotido-femoral segment (L). PWV was calculated as follows: PWV = L/TT. Flow-mediated dilation (FMD) of the brachial artery was assessed following existing guidelines.26 In brief, the right brachial artery was imaged 5 to 10 cm proximal to the antecubital crease in a longitudinal plane. A segment with clear near and far wall lumen-intimal interfaces was selected. The same image was maintained throughout the procedure using a probe-holder and arm supports. At baseline, diameter and velocity profiles were recorded three times and the mean was used for data analysis. After baseline measurements, a cuff (TMC7, DE Hokanson, Bellevue, WA), placed around the forearm, was rapidly inflated to 200 mm Hg. The cuff was released after 5 minutes, followed by recording of the peak velocity profile within the first 15 seconds. Diameter was measured at 0.5, 0.75, 1, 1.25, 1.5, 2, 3, 4, and 5 minutes after cuff release, using the echo-tracking system described above. Each diameter recording lasted 4 seconds. Mean flow velocity was calculated electronically by multiplying the area under the velocity profile curve (corrected for angle) by the heart rate. FMD was expressed as the maximal absolute and percentage increase in diameter from baseline. Shear rate was estimated as velocity divided by diameter. Peak shear rate, estimated as peak flow velocity divided by baseline diameter, was calculated to quantify the FMD stimulus. FMD responses were normalized by dividing the maximal percentage change in diameter by the peak shear rate.27 Because of the considerable within-subject variability in brachial FMD response, measurements were performed twice (during both visits) and the mean of these two measurements was used for data analysis. Based on reproducibility data acquired in our vascular laboratory prior to the study, a sample size of 42 subjects per group was calculated to detect a between-group difference of 20% in DC of the BA and CFA with a significance level of 0.05 and a power of 80%. For all other measured variables, the calculated sample size was smaller. Distribution of variables was evaluated by Shapiro-Wilk W test. Smoking (yes/no) and current hormonal contraceptive use (yes/no) were modeled as dichotomous variables. Continuous variables were compared between groups by t test for independent samples (normally distributed variables) or Mann-Whitney U test (non-normally distributed variables). Categorical variables were compared between groups by χ2 test. Pearson (for normally distributed variables) or Spearman (for non-normally distributed variables) correlation coefficients were determined to assess the association of aortic AIx and PWV with relevant clinical characteristics. Subsequently, multiple linear regression analyses were used to adjust for significant (p < 0.1) univariate associations of aortic AIx and PWV with clinical characteristics. Values of p < 0.05 were considered significant. All analyses were performed using statistical software (Statistica version 7.1, Statsoft, Tulsa, OK). Data are reported as mean ± SD, median and interquartile range or frequencies (percentages). Clinical characteristics of study participants are shown in table 1. Migraine with aura was diagnosed in 32 (64%) and migraine without aura in 18 (36%) patients. The median time since the diagnosis of migraine had been made was 2.4 years (interquartile range: 1.9 to 3.2). The median attack frequency over the previous year was 1.6 attacks per month (interquartile range: 1.0 to 2.0). The headache was, in the majority of attacks, unilateral in 43 (86%), of pulsating quality in 41 (82%), and of moderate or severe intensity in 48 (96%) patients. Attacks were accompanied by nausea or vomiting in 40 (80%) and photo- and phonophobia in 46 (96%) patients. As acute antimigraine therapy, analgesics were used by 33 (66%), triptans by 9 (18%), ergotamine by 1 (2%), and no medication by 7 (14%) of patients. Blood pressure and heart rate. Peripheral (brachial) and central (aortic) SBP, DBP, and MAP are presented in table 2. Pulse pressures at the aorta, CCA, BA, and CFA (28 ± 4, 39 ± 6, 44 ± 6, and 46 ± 7 and mm Hg) were comparable with those of migraine patients (27 ± 5, 39 ± 8, 44 ± 7, 46 ± 9 mm Hg); the corresponding p values were 0.24, 0.98, 0.60, and 0.44 (Mann-Whitney U test). Heart rate (63 ± 9 vs 62 ± 9 beats per min) did not differ between groups (p = 0.74, t test for independent samples). Arterial wall properties are presented in table 3 and the figure. Aortic augmentation index and pulse wave velocity. Aortic AIx was increased in patients with migraine compared with control subjects (4 ± 10% vs −1 ± 11%, p = 0.02, t test for independent samples). Aortic PWV was increased in patients with migraine compared with control subjects (5.68 ± 0.63 m/sec vs 5.39 ± 0.54 m/sec, p = 0.02, t test for independent samples). Univariate correlations between aortic AIx and PWV and selected clinical characteristics are shown in table 4. After adjustment for age, height, HR, and MAP, aortic AIx correlated independently with the presence of migraine (p = 0.04; model R = 0.66; F statistic = 14.2, p < 0.001). Aortic PWV did not correlate with the presence of migraine after adjustment for age and MAP (p = 0.11; model R = 0.63; F statistic = 21.2, p < 0.001). Baseline brachial diameter (4.50 ± 0.93 mm vs 5.03 ± 0.89 mm) was smaller in patients with migraine as compared to control subjects (p = 0.008, Mann-Whitney U test). Baseline shear rate (32 ± 11 vs 29 ± 11 1/sec) was similar in both groups (p = 0.10, Mann-Whitney U test). After hyperemia, peak shear rate (249 ± 60 vs 202 ± 49 1/sec) was higher in patients with migraine compared to control subjects (p < 0.001, t-test for independent samples). The percentage increase in diameter (7.1 ± 3.9 vs 7.1 ± 2.9%) was similar among groups (p = 0.95, t test for independent samples). The absolute increase in diameter (0.31 ± 0.17 vs 0.36 ± 0.15 mm) tended to be lower in patients with migraine compared with controls subjects (p = 0.053, Mann-Whitney U test). The FMD response normalized to peak shear rate (29 ± 15 vs 37 ± 15 10−3%.sec) was lower in patients with migraine compared with control subjects (p = 0.006, Mann-Whitney U test). The present study set out to investigate arterial structural and functional properties in young adult patients with migraine with or without aura during the interictal phase. The main findings are 1) an increased peripheral (brachial) and central (aortic) blood pressure; 2) a decreased diameter and compliance of superficial muscular arteries; 3) an increased aortic AIx; and 4) a decreased FMD of the brachial artery in patients with migraine compared with control subjects. To strengthen our hypothesis that altered arterial properties are associated with migraine without being the consequence of vascular injury caused by repeated migraine attacks or vasoconstrictor drugs, we studied patients with migraine with a much shorter history of migraine and considerably less use of vasoconstrictor drugs than patients included in a previous study.15 Furthermore, a secondary analysis comparing patients who used vasoconstrictor drugs with those who did not did not reveal any differences (data not shown). However, with only 10 patients who used vasoconstrictor drugs, a significant difference may have been missed. In accordance with a previous study we observed a decreased compliance of the muscular BA and CFA.15 Surprisingly, migraineurs displayed a smaller diameter of muscular arteries (BA, CFA, and STA), which was not observed in the previous study, suggesting that a smaller arterial diameter is specific for young adult patients with a recent onset of migraine. A difference in arterial diameter might be due to a difference in arterial caliber or arterial tone. The former is unlikely as both populations were well matched for known determinants of arterial caliber such as age, gender, and length. Although BMI was slightly higher in patients than controls, it cannot explain the smaller arterial diameter in patients with migraine, as BMI is positively related to arterial diameter.36 Furthermore, no significant difference in arterial diameter was observed at the CCA, an elastic artery in which changes in vascular smooth muscle tone are likely to have less influence on arterial diameter and compliance compared with muscular arteries. Taken together, these observations suggest a generalized increase in vascular smooth muscle tone in patients with migraine. It is tempting to speculate that an increased arterial tone predisposes patients with migraine for vasospastic disorders, including variant angina and Raynaud phenomenon, and for vascular adverse events associated with vasoconstrictor antimigraine drugs. Migraine has been associated with cervical artery dissection.9 In patients with spontaneous cervical artery dissection, abnormal elastic properties of the carotid artery have been observed.37 In addition, the activity of serum elastase, an enzyme that degrades extracellular elastin-type peptides, was found to be increased in elderly patients with migraine.38 These observations suggest that elastic properties of the arterial wall are altered in patients with migraine. However, elastic arterial wall properties did not differ between groups. We also assessed IMT, a structural arterial wall property with prognostic significance.14 IMT was not significantly different between patients with migraine and controls, which is in accordance with our previous observations.15 Interestingly, a smaller carotid IMT was observed in elderly subjects with a history of migraine.29 Only long-term prospective studies can establish whether IMT increases more slowly with ageing in patients with migraine. In the present study, aortic AIx was increased in young adult migraineurs after adjustment for age, height, HR, and MAP. Aortic PWV, a marker of aortic stiffness, did not differ between both populations after adjustment for age and MAP. Consequently, the observed increase in AIx is likely caused by altered intensity of reflected waves. Pressure wave reflection is determined by the diameter and compliance of small arteries and arterioles. Again, this suggests that migraine is associated with an increased arterial tone. A study in Japanese patients with migraine showed that several measures reflecting arterial stiffness, derived from fingertip plethysmography waveforms, were altered during headache-free intervals.39 The authors interpreted these waveform abnormalities as a peripheral circulation disorder of vasoconstrictive nature. Interestingly, they observed most consistent differences between both populations in the younger subgroups. In the present study, brachial artery FMD was measured to assess endothelial vasomotor function in patients with migraine. When expressed as the percentage increase in brachial artery diameter, no difference was observed between populations. However, baseline diameter differed significantly between groups, making comparison of FMD responses difficult. For any given absolute change in diameter, a larger baseline diameter yields a smaller percentage change. Therefore, existing guidelines recommend reporting absolute changes in diameter.26 Furthermore, smaller arteries dilate more in response to reactive hyperemia, which may be explained by the tendency for smaller arteries to experience a greater stimulus, i.e., shear stress.27 Indeed, peak shear rate, a surrogate measure of peak shear stress, was significantly higher in patients with migraine. We normalized the FMD response for the magnitude of the stimulus, as previously described.27 Thus, FMD was lower in patients with migraine when expressed as absolute change or stimulus-normalized response. To our knowledge, only three previous studies have assessed endothelium-dependent vasodilation in patients with migraine. Studies in only 10 to 12 patients with migraine did not observe a difference in radial or brachial FMD between patients and controls.40,41 However, these studies were likely underpowered and did not investigate patients with recent onset of migraine. Recently, a decreased brachial FMD was observed in a group of 45 patients without aura.42 Interestingly, endothelial dysfunction is associated with vasospastic disorders.43,44 Thus, endothelial dysfunction could explain the association between migraine and vasospastic disorders. Supported by a grant from the Research Foundation—Flanders (F.W.O.—Vlaanderen). Floris Vanmolkot was a Junior Research Fellow of the F.W.O.—Vlaanderen. Received September 8, 2006. Accepted in final form February 5, 2007. Silberstein SD. Migraine Lancet 2004;363:381–391. Lipton RB, Hamelsky SW, Stewart WF. Epidemiology and impact of headache. In: Silberstein SD, Lipton RB, Dalessio DJ, eds. Wolff's headache. 7th ed. New York: Oxford University Press, 2001:85–107. Leonardi M, Steiner TJ, Scher AT, Lipton RB. The global burden of migraine: measuring disability in headache disorders with WHO's Classification of Functioning, Disability and Health (ICF). J Headache Pain 2005;6:429–440. Parsons AA, Strijbos PJ. The neuronal versus vascular hypothesis of migraine and cortical spreading depression. Curr Opin Pharmacol 2003;3:73–77. Pietrobon D, Striessnig J. Neurobiology of migraine. Nat Rev Neurosci 2003;4:386–398. Bousser MG, Welch KM. Relation between migraine and stroke. Lancet Neurol 2005;4:533–542. Miller D, Waters DD, Warnica W, Szlachcic J, Kreeft J, Theroux P. Is variant angina the coronary manifestation of a generalized vasospastic disorder? N Engl J Med 1981;304:763–766. O'Keeffe ST, Tsapatsaris NP, Beetham WP, Jr. Increased prevalence of migraine and chest pain in patients with primary Raynaud disease. Ann Intern Med 1992;116:985–989. Tzourio C, Benslamia L, Guillon B, et al. Migraine and the risk of cervical artery dissection: a case-control study. Neurology 2002;59:435–437. Joutel A, Corpechot C, Ducros A, et al. Notch3 mutations in cerebral autosomal dominant arteriopathy with subcortical infarcts and leukoencephalopathy (CADASIL), a mendelian condition causing stroke and vascular dementia. Ann NY Acad Sci 1997;826:213–217. Terwindt GM, Haan J, Ophoff RA, et al. Clinical and genetic analysis of a large Dutch family with autosomal dominant vascular retinopathy, migraine and Raynaud's phenomenon. Brain 1998;121 (Pt 2):303–316. Colson NJ, Lea RA, Quinlan S, Griffiths LR. The role of vascular and hormonal genes in migraine susceptibility. Mol Genet Metab 2006;88:107–113. Oliver JJ, Webb DJ. Noninvasive assessment of arterial stiffness and risk of atherosclerotic events. Arterioscler Thromb Vasc Biol 2003;23:554–566. Van Bortel LM. What does intima-media thickness tell us? J Hypertens 2005;23:37–39. de Hoon JN, Willigers JM, Troost J, Struijker-Boudier HA, van Bortel LM. Cranial and peripheral interictal vascular changes in migraine patients. Cephalalgia 2003;23:96–104. Headache Classification Subcommittee of the International Headache Society. Classification and diagnostic criteria for headache disorders, cranial neuralgias and facial pain. Cephalalgia 1988;8:1–96. Tom T, Brody M, Valabhji A, Turner L, Molgaard C, Rothrock J. Validation of a new instrument for determining migraine prevalence: the UCSD Migraine Questionnaire. Neurology 1994;44:925–928. Hoeks APG, Brands PJ, Smeets FAM, Reneman RS. Assessment of the distensibility of superficial arteries. Ultrasound Med Biol 1990;16:121–128. Willekes C, Hoeks APG, Bots ML, Brands PJ, Willigers JM, Reneman RS. Evaluation of off-line automated intima-media thickness detection of the common carotid artery based on M-line signal processing. Ultrasound Med Biol 1999;25:57–64. de Hoon JN, Willigers JM, Troost J, Struijker-Boudier HA, Van Bortel LM. Vascular effects of 5-HT1B/1D-receptor agonists in patients with migraine headaches. Clin Pharmacol Ther 2000;68:418–426. Kelly R, Hayward C, Ganis J, Daley J, Avolio A, O'Rourke M. Noninvasive registration of the arterial pressure pulse waveform using high-fidelity applanation tonometry. J Vasc Med Biol 1989;1:142–149. Van Bortel LM, Balkestein EJ, van der Heijden-Spek JJ, et al. Non-invasive assessment of local arterial pulse pressure: comparison of applanation tonometry and echo-tracking. J Hypertens 2001;19:1037–1044. Millasseau SC, Patel SJ, Redwood SR, Ritter JM, Chowienczyk PJ. Pressure wave reflection assessed from the peripheral pulse: is a transfer function necessary? Hypertension 2003;41:1016–1020. Nichols W, O'Rourke M. McDonald's blood flow in arteries: theoretical, experimental and clinical principles. London, UK: Arnold, 2005.
van der Heijden-Spek JJ, Staessen JA, Fagard RH, Hoeks AP, Boudier HA, van Bortel LM. Effect of age on brachial artery wall properties differs from the aorta and is gender dependent: a population study. Hypertension 2000;35:637–642. Corretti MC, Anderson TJ, Benjamin EJ, et al. Guidelines for the ultrasound assessment of endothelial-dependent flow-mediated vasodilation of the brachial artery: a report of the International Brachial Artery Reactivity Task Force. J Am Coll Cardiol 2002;39:257–265. Pyke KE, Tschakovsky ME. The relationship between shear stress and flow-mediated dilatation: implications for the assessment of endothelial function. J Physiol 2005;568:357–369. Wiehe M, Fuchs SC, Moreira LB, Moraes RS, Fuchs FD. Migraine is more frequent in individuals with optimal and normal blood pressure: a population-based study. J Hypertens 2002;20:1303–1306. Tzourio C, Gagniere B, El Amrani M, Alperovitch A, Bousser MG. Relationship between migraine, blood pressure and carotid thickness. A population-based study in the elderly. Cephalalgia 2003;23:914–920. Rasmussen BK, Olesen J. Symptomatic and nonsymptomatic headaches in a general population. Neurology 1992;42:1225–1231. Scher AI, Terwindt GM, Picavet HS, Verschuren WM, Ferrari MD, Launer LJ. Cardiovascular risk factors and migraine: the GEM population-based study. Neurology 2005;64:614–620. Hagen K, Stovner LJ, Vatten L, Holmen J, Zwart JA, Bovim G. Blood pressure and risk of headache: a prospective study of 22 685 adults in Norway. J Neurol Neurosurg Psychiatry 2002;72:463–466. Lewington S, Clarke R, Qizilbash N, Peto R, Collins R. Age-specific relevance of usual blood pressure to vascular mortality: a meta-analysis of individual data for one million adults in 61 prospective studies. Lancet 2002;360:1903–1913. Kurth T, Gaziano JM, Cook NR, Logroscino G, Diener HC, Buring JE. Migraine and risk of cardiovascular disease in women. JAMA 2006;296:283–291. Williams B, Lacy PS, Thom SM, et al. Differential impact of blood pressure-lowering drugs on central aortic pressure and clinical outcomes: principal results of the Conduit Artery Function Evaluation (CAFE) study. Circulation 2006;113:1213–1225. Zebekakis PE, Nawrot T, Thijs L, et al. 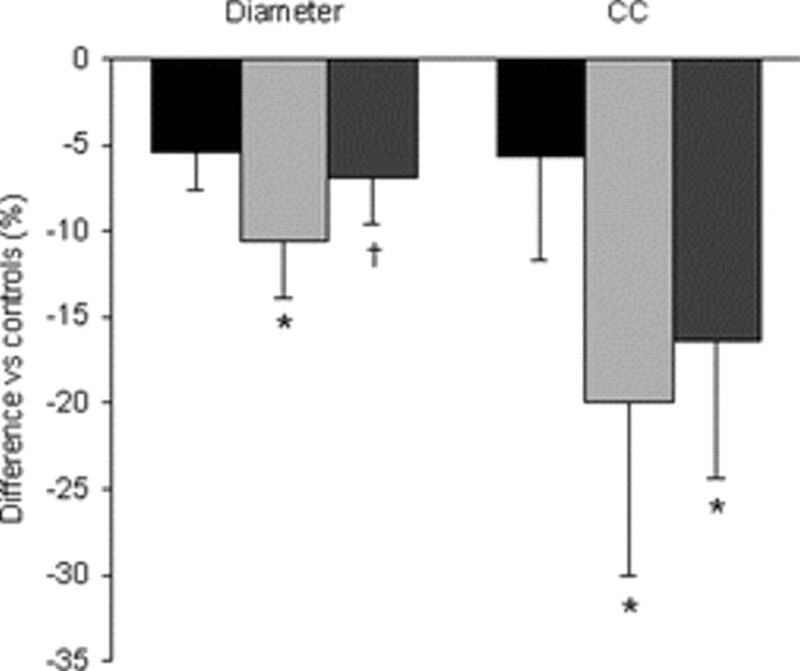 Obesity is associated with increased arterial stiffness from adolescence until old age. J Hypertens 2005;23:1839–1846. Calvet D, Boutouyrie P, Touze E, Laloux B, Mas JL, Laurent S. Increased stiffness of the carotid wall material in patients with spontaneous cervical artery dissection. Stroke 2004;35:2078–2082. Tzourio C, El Amrani M, Robert L, Alperovitch A. Serum elastase activity is elevated in migraine. Ann Neurol 2000;47:648–651. Komatsu K, Fukutake T, Hattori T. Fingertip photoplethysmography and migraine. J Neurol Sci 2003;216:17–21. Thomsen LL, Daugaard D, Iversen H, Olesen J. Normal radial artery dilatation during reactive hyperaemia in migraine without aura. Endothelium 1996;4:199–206. de Hoon JN, Smits P, Troost J, Struijker-Boudier HA, Van Bortel LM. Forearm vascular response to nitric oxide and calcitonin gene-related peptide: comparison between migraine patients and control subjects. Cephalalgia 2006;26:56–63. Yetkin E, Ozisik H, Ozcan C, Aksoy Y, Turhan H. Decreased endothelium-dependent vasodilatation in patients with migraine: a new aspect to vascular pathophysiology of migraine. Coron Artery Dis 2006;17:29–33. Kugiyama K, Ohgushi M, Motoyama T, et al. Nitric oxide-mediated flow-dependent dilation is impaired in coronary arteries in patients with coronary spastic angina. J Am Coll Cardiol 1997;30:920–926. Freedman RR, Girgis R, Mayes MD. Endothelial and adrenergic dysfunction in Raynaud's phenomenon and scleroderma. J Rheumatol 1999;26:2386–2388. Verbeke F, Segers P, Heireman S, Vanholder R, Verdonck P, Van Bortel LM. Noninvasive assessment of local pulse pressure: importance of brachial-to-radial pressure amplification. Hypertension 2005;46:244–248.